Cables might be a necessity at times, but they’re not all the time. Even in spots where you think you’d absolutely need a cable (eSports! ), you may just need a better tool. Enter Corsair’s ‘Unplug and Play’, with the wireless K63 keyboard and Dark Core mouse – both offering 1ms latencies. For good measure, we’ll also take a look at the MM1000 mousepad. It may be 2018, but even in our technologically rich age, we’re still constrained by the devil. And by devil, I mean “cables”. It’s annoying to have your headphone cable caught on your arm rest when you get up. It’s annoying to feel a rat’s nest of cables under your desk with your feet. It’s annoying to set your wired mouse down flat, only to see it move because the cable is pulling on it. Enter the “Unplug and Play” gaming lifestyle Corsair’s touting with the help of a handful of wireless peripherals launched at last month’s CES. 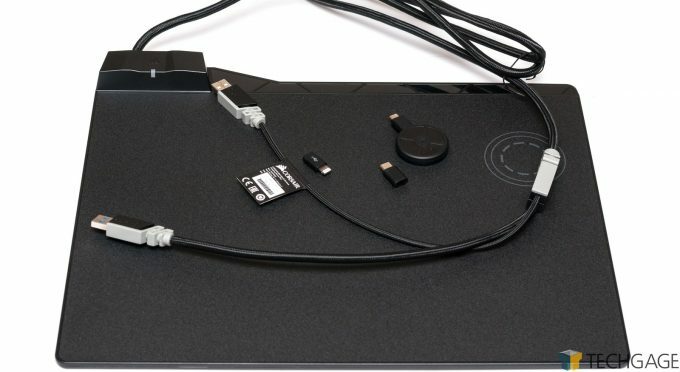 For this article in particular, I’m going to be taking a look at the MM1000 mousepad, Dark Core RGB SE mouse, and the wireless iteration of the popular K63 keyboard. 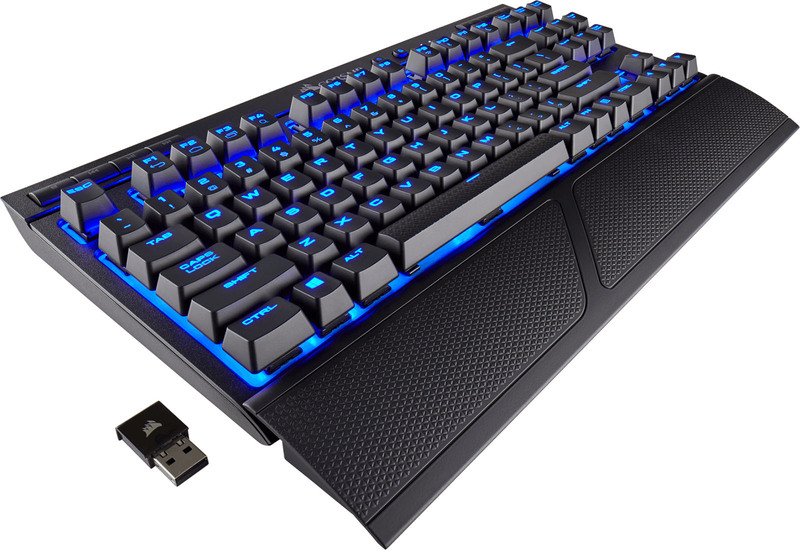 In addition to the three products being looked at here, Corsair released two other complementing products: K63 Lapboard, and VOID PRO RGB headset. We have these in the lab, but will be saving our look at them at a later date. The three products featured here have been heavily used the past two weeks, whereas I’ve been unable to jump on the others as of this point. The K63 sports a tenkeyless design, and surprisingly, it isn’t RGB. Instead, the default color scheme available is a darker blue, though a special edition with ice blue is also available. 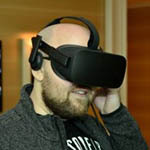 That one is probably available more as a complement to the company’s ONE PC lineup, which it just updated with a couple of new models. How on Earth can a mousepad cost $79.99 USD? By including Qi wireless charging, that’s how. After two USB plugs are connected to 3.0 ports, Qi-supported devices can be charged by being placed on the circle design on the top-right hand corner of the pad. Corsair includes some accessories to let you charge your USB-C, micro-USB, and Lightning mobile devices with the wireless capabilities. On the topic of those wireless capabilities, both the Dark Core and K63 utilize 2.4GHz wireless and can deliver latencies as low as 1ms. For the record, that’s as good as the top-tier gaming mice on the market, so effectively, these wireless peripherals aim to be just as every bit as accurate as their wired brethren. The tenkeyless K63 wireless keyboard looks exactly like the wired version, except that one has red LEDs. It also completely lacks the palm rest included with the wireless version, and personally, I’m very thankful for that addition. At the top-left of the keyboard are media control buttons, while volume buttons are found at the opposite end. Near the center, to the right of the Corsair logo, an LED enable/disable button is found next to a Win key lock. Under the keys is a baby blue base. I’m not personally a fan of this part of the aesthetic (I wish it were darker blue), but the upside to the lighter color is that dirt will show up a lot easier. In my case, it means I’ll clean my keyboard more often than once in a blue moon. As with any modern LED keyboard worth its weight, the K63 lets you choose different modes for the lighting effects, including rain, pulse, wave, type lighting, and of course, static. If you’re not in the mood for LEDs at a particular moment, you can quickly hit the button next to the Corsair logo and put an end to them quick. In addition to the 2.4GHz wireless (which requires the USB connector in the box), you can also use Bluetooth with your own adapter (or built-in BT). Switching between these requires you to hit Fn + F9 (2.4GHz) or F10 (BT). At home, you may as well leave the keyboard plugged in, because chances are that’s one cable that generally doesn’t get in your way (not like a mouse one, anyway). 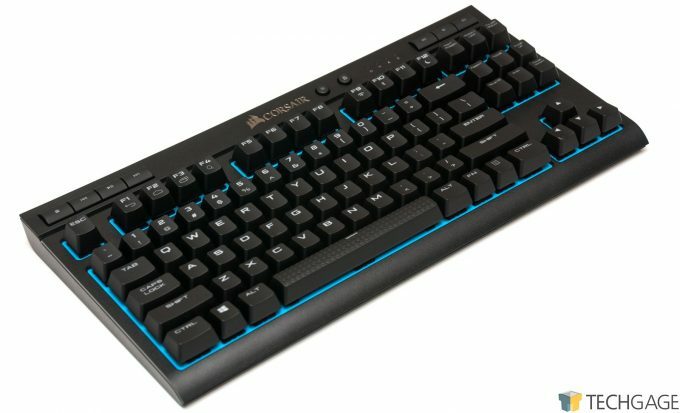 Corsair brags up the fact that this plank includes genuine CHERRY MX red switches, which happen to be my personal favorites. It’s constantly argued that reds are not great for typists, but I somehow managed to write this article up with them without a single tear being shed. Allegedly, I completely blanked on photographing the keyboard with its palm rest, so please excuse the laziness by linking you to a better shot than I could take. It’s hardly the heaviest-duty palm rest out there, but it gets the job done. The textured surface feels good to rest your hands on, as well. It’s grippy, without irritation after long use. It’s also worth mentioning that this version of the K63 has an AES-128 encryption option, for when you need to type more sensitive data. An upside is that sniffers can’t read what you’re typing, but the amount of latency added makes it pointless for gaming. At a press event held during CES, we were told that encryption could result in latencies up to 80ms, which is a far cry from the 1ms goal of the device. Alternatively, you could simply plug the keyboard back in and negate the need for encryption, and avoid the performance hit at the same time. Out-of-the-box, the Dark Core includes two grips. Note, these are not thumb rests, but instead grips for the right side of this right-handed mouse. The secondary option gives your fingers a place to rest, meaning that they won’t be scraping along the mousepad as you try to nail that headshot. Corsair says its Dark Core can last up to 24 hours on a single charge, although you’ll never have to worry about that if you have the complementary MM1000 Qi mousepad (more on that in a minute). 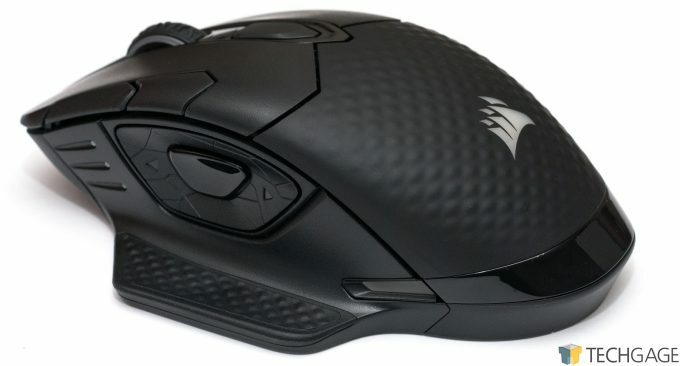 The mouse also features on-board profiles, a surface calibration option, full RGB (as its name implies), nine programmable buttons, three DPI settings, and what I consider to be one of the best-placed “sniper” buttons I’ve used. In the third shot above, you can see a button in the center of the thumb rest, and surrounding it are more buttons (acting as back / forward by default). Pushing in the sniper button will allow you to drop the DPI down to a preset value (I tested with 100 mostly, which is the lowest you can go), which can dramatically improve situations in games where pinpoint accuracy is required. Interestingly, I found good use for this button outside of gaming, as well. I regularly screenshot regions of my screen, either to share or capture images for content, and often, it’s a tedious endeavor to be pixel-perfect, and not have to further edit the capture in Photoshop after-the-fact. No need for that with this button, as it slows the cursor down enough to let me be much more precise. This all said, while I love where the sniper button is, the “forward” is a little bit further ahead than I like, although personally, it doesn’t affect my gameplay, since I rarely use that button anyway (I do use the “back”, however). Overall, I don’t have a major complaint about the design of this mouse. At first, I wasn’t a fan of the positioning of the front-left buttons, which are used for changing the DPI profiles, but if you continue to use them for that purpose, you’re not going to be touching them all too often. The sniper button should help with that need. With its PixArt PMW3367 optical sensor, the Dark Core can be equipped with DPI levels ranging from 100 – 16,000, in steps of 1 DPI. Like the keyboard, you can use wired mode if you’re at home, or need a quick charge. Otherwise, you can set the mouse on the MM1000’s Qi spot and charge it overnight (just don’t forget to do it, like I do 100% of the time). Included with both the keyboard and mouse is a USB adapter that allows you to move your wireless receiver closer to your desk, in the event you end up having wireless hiccups. The USB cable you’d ordinarily plug into the mouse or keyboard to charge would instead plug into this adapter, which then allows a wireless receiver to be plugged into it. Unfortunately, one wireless adapter won’t work for multiple peripherals at once, so even though these are wireless, one USB wireless adapter will be needed for each one.